"Canadian home prices in June were up 1.7% from the previous month, according to the Teranet–National Bank National Composite House Price Index. This rise took the index to a new high of 144.27 (June 2005 = 100). It was the third consecutive monthly increase exceeding 1% and the largest rise since August 2009. It was also the seventh consecutive monthly increase, coming after three straight monthly declines. As in April and May, prices were up in all six of the metropolitan markets surveyed. What is new is that in all six markets the June monthly rise was at least 1%, a first since April 2005. It was 2.0% in Toronto, 1.7% in Vancouver and Ottawa, 1.6% in Calgary, 1.1% in Montreal and 1.0% in Halifax." MP: The chart above shows how the Canadian home price index compares to the 20-city Case-Shiller Composite Index for the U.S., when both indexes are adjusted to equal 100 in January 2000. From 2000 to 2005, home prices in the U.S. doubled (+100%), while Canadian home prices increased by only 50%. Since then, U.S. home prices have fallen by 30% and Canadian home prices increased by another 40%. Compared to January 2000, U.S. home prices have appreciated by 41% and Canadian home prices are up by 112%. Q1: Are Canadian home prices in an unsustainable bubble headed for a future major correction or crash? Or are the home price increases in Canada sustainable? Q2: Could the U.S. have avoided a housing bubble and crash, with a lower but more sustainable rate of home price appreciation in the 2000s, similar to Canadian home prices, if we had not had the massive government interventions in the housing and mortgage markets? There is no home mortgage interest tax deduction in Canada. Also, would be interesting to look at Canada's commercial real estate markets. Our office and retail markets collapsed just like housing, despite little federal intervention (but plenty of local and state props).
" Our office and retail markets collapsed just like housing, despite little federal intervention (but plenty of local and state props)." it's true where I live.. a disaster..
so how is that explained? What's the best tax break available to Jane and John Q. Public? If they're homeowners, it's selling their house. Homeowners already know the many tax breaks that Uncle Sam offers, most notably mortgage interest and property tax deductions. Well, he also has good tax news for home sellers: Most of them won't owe the Internal Revenue Service a single dime. When you sell your primary residence, you can make up to $250,000 in profit if you're a single owner, twice that if you're married, and not owe any capital gains taxes." It is odd that no one ever mentions the incredibly lush tax treatment for homebuyers as the major cause for over-investment in housing. But then, that would not be PC, would it? Charts like this suffer from a lack of context; they look like the two were equivalent in 2000, but it's possible that Canadian housing was massively undervalued then, and a decade of catch-up was needed. Does the exchange rate (USD's lost 1/3 against the loony since 2000) matter? I'd rather see a chart of housing costs v. disposable income. I won't touch the argument about "massive government intervention" today. Real world explanations are complicated, so usually people resort to sing-song PC explanations, or the braying of carnival barkers. 1. The Fed tightening in 2008 when it should not have. But the above explanation is holistic, and not PC. So neither the leftards or right-wing dunderheads want to read it. Friends of mine live in Toronto, Canada. Anecdotally - and nothing more - friends of theirs bought a 3200 sq ft home for $440k in 1989. Later that year the market crashed. In 1995, my same friends bought a home 5 doors down, on the same street, for $290. As of 2008, both of their homes were worth $600k. So, I think, in a sense you're right. The 90s were a lost decade for Toronto (and Canadian) real estate. However, the real economy has not been catching up with home prices, such that they are beginning to overheat quite a bit. Case in point: Another Torontonian I know bought a 2nd story condo in 2005 for $209k and sold it in 2009 for $309k; a roughly 12% annual increase. The market's getting way too hot in Canada. David: Neither the Case-Shiller nor the Teranet National indexes are stated in dollars, they are both index measures based on underlying dollar values. We know the U.S. had a housing bubble in the 2000s and a major correction, and the comparison to Canada's home price index allows us contrast home price appreciation in the two countries. Comparing home prices to income would be a good idea, but I don't have price data for Canada, and I think the graphical pattern would maybe be similar to the current chart? Colorado House Price Index was flat from 1982-90, tripled by 2006, and fell slightly after 2008. Yah, I understand they're indexes, but that's the point - they reveal only one thing, which is the change in value of each line relative to its starting point. It doesn't show enough about their relationship to each other. Ex: Suppose Canadian housing was objectively 30% cheaper than U.S. housing in 2000. Both indexes start at 100, and the relative valuation is hidden. We might expect the disparity to close over time, but this would show up on the chart as a divergence of the lines. Just looking at the lines might lead us to believe that Canadian housing had gotten expensive, when in reality it was just closing the gap. If the Canada line started at 70 instead of 100, reflecting this supposed lower valuation, the chart is dramatically different; both the Canada and U.S. lines would be around 140 today, which would indicate that Canada's housing isn't expensive relative to the U.S., and isn't bubbly. It would also show a much more massive bubble in the U.S. relative to Canada. So I don't think there's enough data to reach any conclusions, though there's certainly enough to warrant a little additional digging. And I see you've gotten some links while I've been formulating this. Also, the Colorado House Price Index more than doubled in the 1990s. I can get U.S. housing price or index data back for quite a long time, but can only get Canada's Teranet home price index back to 1999. 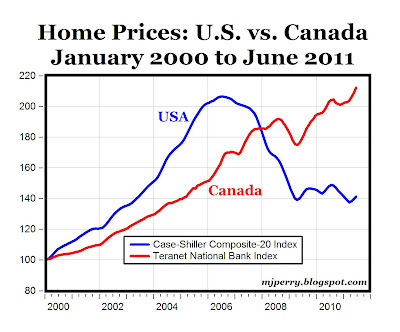 Therefore, I can't provide a longer time comparison of home prices in Canada vs. USA. If anybody has a longer time series of Canada home prices, I would love to get it. Candian home owners are much older than US hoe owners because there is not interest tax deduction. It takes longer to get into a home and less time is available to accrue the benefits it provides. Home prices in Canda may be going ou while avaialbility and affordability are going down. American builders have long been selling houses for near what they cost to build. Their profit comes from the land transactions under the homes. Q1: I remember an interview with a Canada (maybe former) finance minister in WSJ in summer of 2010. I seem to recall him saying that they never relaxed their lending standards, didn't get caught up in the 'spreading the dream of home ownership' and thought that renting made sense for some folks. Given that stance, I wouldn't think this would be a bubble, unless that thinking has changed. Has the rate of home ownership changed much there? We got to the point where we ran out of buyers because most everyone had one or two homes. Are they getting there? Q2: The U.S. would have avoided the housing crash if we didn't relax lending standards. In Canada there is NO tax deduction of interest on mortgages...period. (you can't deduct the interest on the loan for your summer cabin, boat or your Winnebago!) The interest rate resets at intervals of your choosing...from variable, month to month, to a maximum of 5 to 7 years typically. Variables are today's rate, you pick a 5 year you'll genearally pay a higher interest rate for the "peace of mind" (no surprises for the number of years picked). It's your call. When a Canadian defaults on a mortgage the lending institution can go after ALL assets of the borrower...if he's got any left. There is no such thing as just "giving the keyes back to the bank" and that's the end of it. 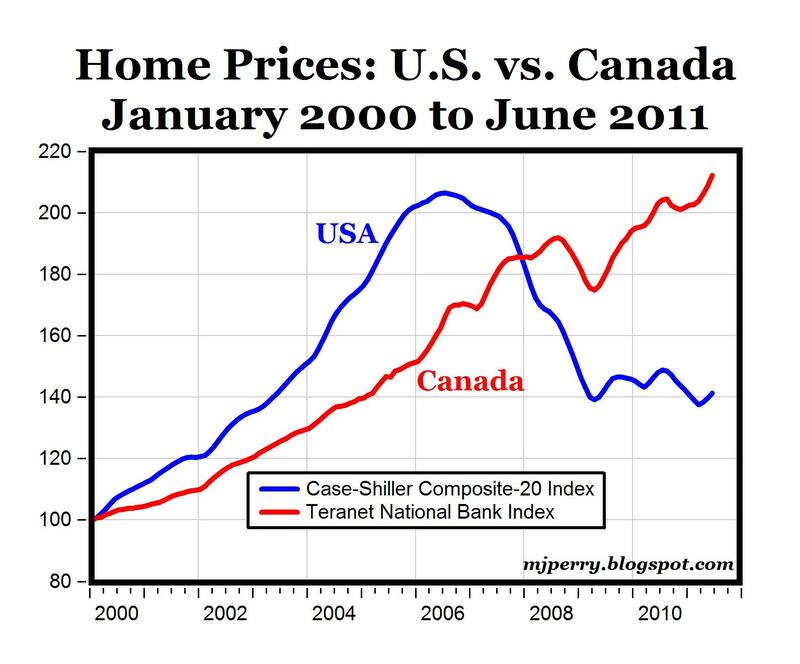 Home ownership in Canada was about the same (slightly lower) before 2008 and now is higher than in the US...obviously. But the biggest difference between the two markets is probably "cultural"....it is ingrained in all Canadians that the key to financial freedom is to pay off your mortgage....not so in the US as I understand it. certain canadian markets are clearly in badly overheated bubbles. vancouver has been running wild. the nation as a whole has seen home prices rise for a decade at triple the rate of income growth, but vancouver has been much worse. average homes are now over $1mm. there has been a ton of asian buying, speculation, flipping etc. it shows all the sings of a nasty bubble forming. as mortgage debt is full recourse in canada, a bubble bursting would be REALLY nasty. to a great extent, canada can balme the US for this. our largest export at the moment is negative real interest rates. they navigated the first part of this crisis quite well, but we are now pulling them over the falls. to raise rates would hurt their exports to the US a ton. they are left with a rotten choice of tanking the economy or inflating a housing bubble. with friends like us, who needs enemies? truth or consequences says "It is ingrained in all Canadians that the key to financial freedom is to pay off your mortgage....not so in the US as I understand it." Yes, but the price of that goal is much higher for Canadian homeowners than American homeowners. I think so. My place has almost doubled in the past six years. That is difficult to justify if you look at income growth, which means that housing prices depend on low interest rates and a stable job environment. Canadian families have a huge amount of debt and have little room for error. If the US goes into a recession again or rates tick up there could be at least a 20% correction in housing. Possibly, but give the actions of the Fed there would have been a bubble somewhere else. First, the rate of housing appreciation peaked in 2005. By 2006 houses were no longer going up. Without the Fed's loose money policies and the GSE's there would have been no housing bubble.
" Yes, but the price of that goal is much higher for Canadian homeowners than American homeowners"
we're not paying the price of the housing bubble? Each State in the US can and does put restrictions on mortgages (such as required equity) and whether or not non-recourse is required. so how did the bubble go nationwide if each State has different laws? Larry, the gains of banks and governments are the losses of Canadian homeowners. Im from Canada and I can testify that home prices have risen significantly since 2000, but I believe we are in a bubble. It ranges from market to market, but the variance is anywhere from 10 - 30% overvalued. Although, Canada did not have exotic mortgages or have interest tax deductions, it does have common factor with other markets that make it very vulnerable ... low interest rates. Low rates have caused a spending spree and sapped future demand from prospective buyers who wanted to take advantage of the low rates. Once they go up, the situation will be quite different. Homeowners will struggle with monthly payments and more expensive mortgage rates will dry up appetites. A similar situation happened in the 90's where home prices were in a malaise period due to high rates. Whats worse, I think we are in the golden era of Canadian real estate. Not only will higher rates sap demand, but retiring baby boomers will seek to cash in on their home investment adding further inventory into the market stagnating prices or driving them downward. Hope its not the case, but history often is the best judge of the future. While I agree in general we should not discount the temporary pressures being put on the markets in big cities by immigrants with a great deal of money who see our prices as bargains when compared to Europe, Middle East, and Asia. One of my friends just sold a Shanghai condominium for close to $5 million. The same size and quality condo in Toronto sells for less than $1 million. He is looking for a $1.5 million house instead. My wife's friends just came back from the UAE. They purchased three condominiums that will be rented with 75% down and bought a house outright. They rent the basement. The cash flows are more than sufficient to cover all their living expenses, financing, and to have a great deal left over for savings. Perhaps it is the circles that I move in but there are many other similar cases that I know of where foreigners are dumping very expensive European, Middle Eastern, and Asian properties and looking to purchase in Canadian cities where the prices are low by comparison. Their strategy seems to be one in which they protect themselves by purchasing real assets and having enough liquidity to take advantage of opportunities brought about by a steep decline. I think that it was buyers like them that saved the markets in places like Toronto, Vancouver, Calgary and Mississauga. I only worry about what happens when their other holdings turn down and they get a little worried about cash flows. Another Company Moves Production Back to U.S.